"LW4" redirects here. For Paralympic skiing classification, see LW4 (classification). Lethal Weapon 4 is a 1998 American buddy cop action comedy film directed and produced by Richard Donner, and starring Mel Gibson, Danny Glover, Joe Pesci, Rene Russo, Chris Rock, and Jet Li (in his American film debut). It is the fourth and final installment in the Lethal Weapon film series. Lorna Cole (Rene Russo) is pregnant with LAPD Sergeant Martin Riggs' baby; they are not married, but both are thinking about it. LAPD Sergeant Roger Murtaugh's daughter Rianne (Tracie Wolfe), is also pregnant. Due to issues with the department's insurance carrier over Riggs and Murtaugh's actions as sergeants, Captain Murphy (Steve Kahan) promotes them to captains. The officers along with Leo Getz (Joe Pesci) come upon a Chinese immigrant smuggling ring after running an ocean-going vessel aground, though the captain of the boat escapes. In the subsequent investigation, Murtaugh finds Hong (Eddy Ko) and his family hiding from US Immigration officers to avoid deportation. Murtaugh offers them shelter in his home, and their families, along with Riggs and Cole, quickly bond. Hong reveals he is looking for his uncle, a skilled engraver, who had paid for their passage to the United States. Riggs discovers that Murtaugh's grandchild is with Detective Lee Butters (Chris Rock), which Murtaugh cannot possibly tolerate as he did not want his daughter to marry a police officer, and that Murtaugh still does not know who the father is due to the family hiding it from him. Continued investigation of the smuggling ring leads the officers to "Uncle" Benny Chan, a crime boss operating from a Chinatown restaurant. There, they are introduced to high-ranking Triad negotiator Wah Sing Ku (Jet Li). Chan forces them out of his restaurant when the officers show no probable cause. Outside, Riggs spots the escaped captain and tries to give chase but fails to capture him. However, Ku later intercepts the captain and kills him as punishment for attracting the police's attention. Chan and Ku take steps to eliminate all those in on their plans. Hong is able to contact his uncle, but this leads the Triads to Murtaugh's house. Ku and the Triad thugs kidnap the Hongs, tie up Murtaugh, his family, Riggs and Cole and set the house ablaze. Ping, Hong's grandson, has evaded capture and helps to free the others in time. Though Riggs and Murtaugh chase down and kill some of the Triad, Ku escapes. Ku brings Hong to his uncle at a warehouse, where he has been engraving plates for a counterfeiting operation for Ku and Chan in exchange for transit for his family. Ku kills Hong in front of his uncle to assure his continued work. The officers attempt to shake Chan for more information, but are unable to get any leads until they discuss what they know with Detective Ng (Calvin Jung), who has worked on cases involving the Chinese government before. Ng recognizes that Ku must be trying to negotiate with a corrupt Chinese general for the release of the Four Fathers, high-ranking Triad members that include Ku's brother (Conan Lee). New information leads them to the abandoned warehouse where they find the bodies of Hong, his uncle, and Chan, the latter two killed by Ku after they served their usefulness. Knowing that Ku plans to use counterfeit money, the police intercept the exchange between Ku and the general, telling the general the money is fake. A firefight breaks out between the Triad, the general's private army and the police, and most of the Triad and army are killed. Ku attempts to escape with his brother, but his brother is shot and killed by Murtaugh. Riggs and Murtaugh pursue Ku to a pier where they engage him in a brutal fistfight. Murtaugh impales Ku through the stomach before the pier collapses and sends Riggs and Ku into the water. Riggs is able to find a Kalashnikov assault rifle and finish Ku, while Murtaugh arrives in time to help rescue Riggs from a piece of concrete that had pinned him underwater. Later, Riggs visits his dead wife's grave and asks her for advice about his impending marriage with Lorna, about which he still has doubts; Getz arrives and offers a heartfelt childhood story (where in the process, he admits that Riggs and Murtaugh are like his family) that gives Riggs both a new light on the situation and a new perspective of Getz, himself. They learn Lorna is about to give birth and race to the hospital, where Riggs and Lorna are ceremonially married by a rabbi just before she enters labor. Their son and Rianne's daughter are born, and Murtaugh accepts Butters as his son-in-law. Murphy gives Riggs and Murtaugh their rank of Sergeant back since the city is insured again and Hong's family is granted asylum. Lethal Weapon 4 debuted at No. 1 at the box office. Although the film grossed $130 million in the U.S., it was not considered a runaway financial success as the previous three films had been. Shooting began in January 1998, just months before the film's release, with a production budget estimated at $120–$150 million (although Warner Bros. maintained it cost less than $100 million) and an additional $50 million spent on marketing and distribution. This made the fourth film the most expensive entry of the series. Its profit margin was saved in part due to the combined foreign box office sales making the film gross approximately $285 million in total, making the second highest-grossing film in the Lethal Weapon film series behind, Lethal Weapon 3 (1992). Still, like its predecessors, Lethal Weapon 4 was among the top ten grossing films of its release year. Critical reaction to Lethal Weapon 4 was mixed. The film currently holds a rating of 52% on Rotten Tomatoes based on reviews from 66 critics, and an average rating of 5.8 out of 10. Metacritic, which assigns a normalized rating of 0-100 from mainstream critics, calculated a score of 37 out of 100 based on reviews from 21 critics, which means it has an indication of "generally unfavorable reviews". Audiences polled by CinemaScore gave the film an average grade of "A-" on an A+ to F scale. James Berardinelli gave the film three stars out of four, writing: "Given the expectations that constrain it, Lethal Weapon 4 is probably the best motion picture that could possibly result from another teaming of Martin Riggs and Roger Murtaugh. The series has lost a lot of steam since the first two entries, and, although the fourth movie ratchets up the energy level from the moribund state of the disappointing Lethal Weapon 3, there's no sense of spontaneity." 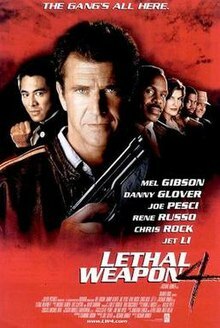 Roger Ebert gave Lethal Weapon 4 two stars out of four, writing: "Lethal Weapon 4 has all the technical skill of the first three movies in the series, but lacks the secret weapon, which was conviction. All four movies take two cop buddies and put them into spectacular and absurd action sequences, but the first three at least went through the motions of taking the plot seriously (and the first one did such a good job, it made my 'best 10' list of that year). This time, we're watching an exercise." Michael O'Sullivan of The Washington Post called it a "stupid and violent delicacy" that balances a "patented blend of high action and low comedy". The film was nominated for a Razzie Award for Worst Supporting Actor for Pesci. Lethal Weapon 4 has been released on VHS and DVD numerous times. It has been re-released in numerous sets that contain all four films in the series. Lethal Weapon 4 was released on Blu-ray Disc as part of a box set with the additional Lethal Weapon films on May 22, 2012. The film's music was composed by Michael Kamen, Eric Clapton, and David Sanborn. This was the only film in the series not to have a soundtrack album released alongside it, but in 2013 La-La Land Records released the score as discs seven and eight of its limited edition Lethal Weapon Soundtrack Collection. ^ a b Josh Wolk (July 13, 1998). "Lethal Weapon 4". Entertainment Weekly. Retrieved September 30, 2010. ^ a b "Lethal Weapon 4". boxofficemojo.com. Retrieved September 30, 2010. ^ "Lethal Weapon 4". Turner Classic Movies. United States: Turner Broadcasting System. Retrieved 26 May 2018. ^ "Lethal Weapon' 4 To Start Shooting Soon". Chicago Tribune. December 22, 1997. Retrieved September 10, 2010. ^ Fabrikant, Geraldine (May 12, 1992). "THE MEDIA BUSINESS: ADVERTISING; Warner's Sequel Weapon Cuts Down Promotion Costs". The New York Times. Retrieved November 8, 2010. ^ Natale, Richard (July 13, 1998). "Action-Hero Films Have $70-Million Blast; Box office: 'Lethal 4' opens at No. 1, 'Soldiers' in third, as 'Armageddon' stays solid". Los Angeles Times. Retrieved December 7, 2010. ^ Welkos, Robert W. (July 14, 1998). "'Lethal' Has a Winning Formula". Los Angeles Times. Retrieved September 11, 2010. ^ Richard Natala (July 14, 1998). "Lethal Comes Out Shooting but Stars Will Drain Profit". Los Angeles Times. Retrieved September 30, 2010. ^ a b Wilmington, Michael (July 10, 1998). "`Weapon' Of Mass Appeal". Chicago Tribune. Retrieved September 12, 2010. ^ Turan, Kenneth (July 10, 1998). "Automatic 'Weapon'". Los Angeles Times. Retrieved September 11, 2010. ^ Maslin, Janet (July 10, 1998). "Film review; Bones Crunch? Jokes Fly? Must Be Gibson and Glover". The New York Times. Retrieved September 11, 2010. ^ "Leathel Weapon 4". rottentomatoes.com. 1998. Retrieved September 30, 2010. ^ "Lethal Weapon 4 Reviews-Metacritic". ^ James Berardinelli. "Lethal Weapon 4". Film review. reelviews.net. Retrieved September 30, 2010. ^ "Lethal Weapon 4". Reviews. rogerebert.com. July 10, 1998. Retrieved September 30, 2010. ^ O'Sullivan, Michael (1998-07-10). "Another Day, Another 'Lethal Weapon'". The Washington Post. Retrieved 2014-12-13. ^ "Lethal Weapon: 4 Film Favorites". amazon.com. Retrieved September 30, 2010. ^ "Lethal Weapon Collection: 1 - 4 (Blu-ray) (Widescreen)". Retrieved 2012-06-18.